We mill precision components for technical industries with our “done in one” CNC multi-tasking milling center. Our Integrex is part of a new family of machines called "multi-tasking centers". 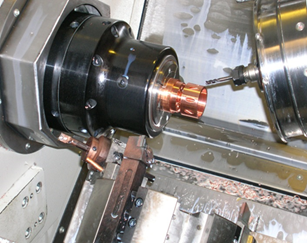 With Integrex, we have 9-Axis milling and turning or lathe capabilities. This configuration allows for virtually any part to be machined in one set up. 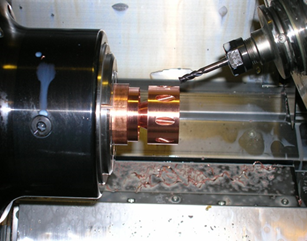 Our “done in one” machining is ideal for most high precision component milling. With a 30 HP, 12,000 RPM articulating milling spindle, it is as robust as any of our machining centers. In addition, Integrex's two 30 HP, 5000 RPM lathe spindles can meet any of our turning needs. Our machines also accommodate parts that have no turned diameters at all. Contact our engineers today to discuss machining your part! Integrex supports twin turret/twin spindle simultaneous machining.